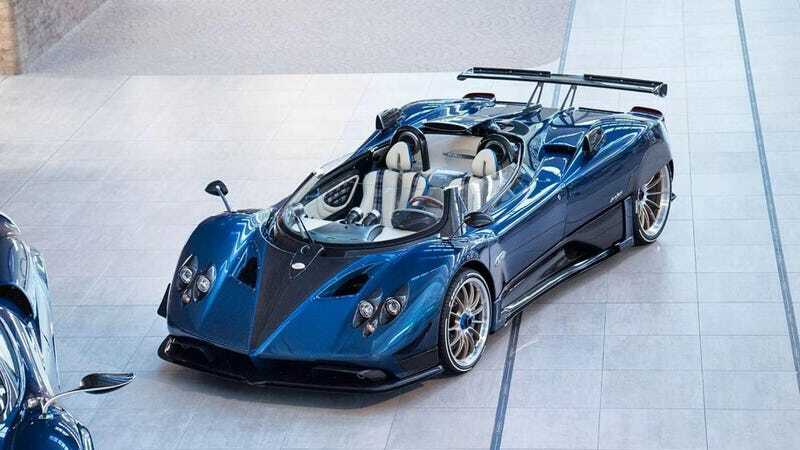 I thought we were done hearing about the Pagani Zonda after its 18-year production run ended last year, but a few special edition stragglers are still showing up in the news. Today, it concerns the Zonda HP Barchetta, which Pagani says will cost $17.5 million. Excuse me while I go throw up. Pagani confirmed the price of the special edition car to Top Gear, saying that the car will be €15 million, which is approximately $17.5 million. Does that make it the most expensive new car ever? Probably! It’s more expensive than the one-off Rolls-Royce Sweptail, which sold for about $13 million. The HP stands for company founder Horacio Pagani’s initials. There will only be three HP Barchettas and one of them belongs to him. The other two have apparently already been spoken for. You missed out. The car has a mighty 7.3-liter, naturally aspirated V12 with 760 horsepower. But! All of that is hooked up to a six-speed manual. Who says manual transmissions are dying out? And if you look at it carefully, you’ll notice that it has unique window designs, rear-wheel fairings and a roof scoop, despite it being roofless. And it’s a very pretty blue. Would I buy something like that? Let me run down to the local 7-Eleven for a scratch-off and I’ll check back in with you. Correction 8:42 a.m.: The Zonda has the 7.3-liter naturally aspirated V12, not the twin-turbo. This post has been updated to reflect that.